Our recruiting and renewals improved some this year with 25 new members between Feb. 1, 2014 and Feb. 1, 2015. That’s the most new members since 2011-2012, and there were at least 12 current members involved in recruiting the new members. 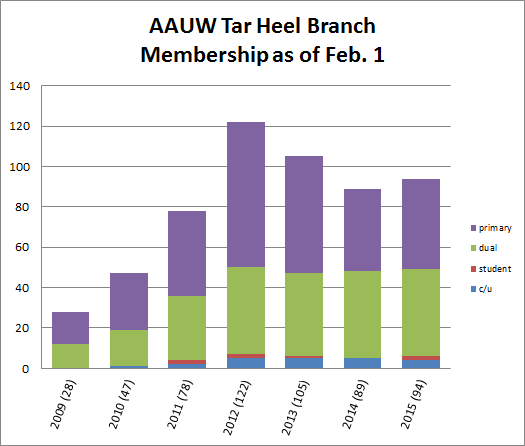 Do you have a friend who might enjoy getting connected to AAUW and AAUW NC? Consider asking them to join this branch — which may be a bridge to getting them more involved in AAUW or our allied organizations in their local community. On the other hand, we did have 20 members resign or lapse. That means our total membership grew from 89 to 94 over the year. We have welcomed back three of the 20 and our membership is currently at 97.